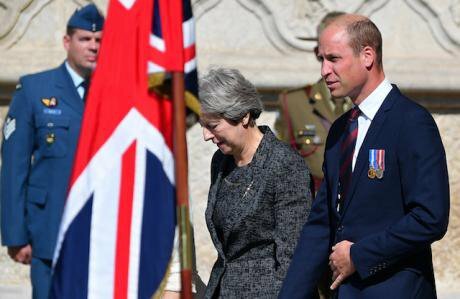 Theresa May and Britain's Prince William in Amiens to mark the 100th anniversary of the World War I battle on August 8, 2018. Liewig Christian/Press Association. All rights reserved. Distinguishing between what one hopes will happen and what is likely to happen is central to the ability to cope with uncertain times. One obvious coping strategy is encapsulated in the phrase, “hope for the best, plan for the worst” – a useful cliché in providing insight into likely events as the Article 50 deadline approaches. Worst outcome for hard line Brexiters? For the hard line Brexiters, “no-deal” at the deadline qualifies as the best outcome, and Britain retaining EU membership the worst. To achieve the hoped for best, their strategy has two steps. First, should the May government reach a mutually satisfactory agreement with EU negotiators, the Tory Brexit faction would seek to defeat it in Parliament. If the May government wins parliamentary approval, that leaves Brexiteers with the least-worst result, Britain out of the EU but still subject to some EU rules. The details of the agreement will determine which rules continue to apply. Should Brexiteers win the Parliamentary vote, their strategy would be to prevent a second referendum. If they cannot prevent the second referendum, they will seek a wording that serves their Brexit goal. In summary, May must call a vote on the agreement which creates the opportunity for the hard line Brexiters; they attempt to reject the agreement and force a leadership change. If the government wins the vote, Brexiters have a viable backup strategy; undermine May’s leadership until a challenge seems winnable. Worst outcome for Labour party progressives? For Labour Party progressives in and out of Parliament, the collapse of the May government followed by a general election that Labour wins jumps out as by far the best outcome. The worst outcome is equally clear – the May government achieves an agreement with EU negotiators that it sells to the public as acceptable. Relieved that Britain has not “crashed out”, voters return a Conservative majority in a snap election. Initially the strategy to avoid the worst coincides with the Brexiter parliamentary opposition to an EU agreement reached by the May government. If prior to the Parliament vote, the Labour leadership were to endorse continued EU membership the probability of success would be lower. A motion of no confidence with the explicit promise of Brexit reversal could increase the number of Labour MPs voting with the Tory government (four did so in July and saved May from a possibly disastrous defeat). Defeating the government strong majority is all the more necessary because of the fixed terms Parliaments act. A change of the Labour leadership’s position on EU membership would come after not before the vote on the agreement reached by the May government. A pro-EU strategy might win a general election but it would make less likely bringing down the May government. Recently British negotiator Dominic Raab and his EU counterpart Michel Barnier separately indicated that bargaining is likely to continue into November. The previous consensus timeline foresaw agreement would be reached no later than the first week of October, then considered for approval by the European Council at their 18 October meeting, and if approved, a Parliament vote shortly thereafter. That time line left a very tight schedule for a second referendum process – legislation through Parliament, the referendum campaign, and the voting on it – all in time for consideration at the 21-22 March meeting of the European Council. A November deadline for negotiations probably rules out a second referendum. After October 18, the European Council does not meet again until December 13 - 14. An earlier, emergency meeting would still imply that Parliament would vote no sooner than late November. The necessary sequence of events for a second referendum – defeat of the government’s agreement, emergence of a pro-referendum majority, legislation passed, the campaign, the vote, European Council meets to consider the outcome – seems an improbable squeeze into the remaining time, not least because of the few working parliamentary working days during December-February. The third route, a new pro-EU government formed after Parliament defeats the agreement, encounters the obstacle that many if not most Remain MPs do not want and would not support a Corbyn-led government. Yet, only a Corbyn government would allow planning to avoid the worst outcome, a no-deal crash-out. Despite considerable talk of a pro-EU third party, no one could believe that such a party could form a government before the Brexit deadline, or that a pro-EU coalition could do so. “Hope for the worst, plan for the best”? What can Remainers do when they cannot hope for the best and draw back from planning for the worst? Following the pro-EU media, most obviously the Guardian newspaper, and the commentary by leading Remainers, their strategy seems to be “hope for the worst” and “plan for the best”. The first involves convincing the British population that the consequences of Brexit is (not “will be” or “might be”) unambiguously disastrous and is happening – breakdown of health care due to lack of medical staff and medicines; collapse of food supplies because of interrupted supply chains; devastation of the export sector; and chaos at the ports and on the roads (for a fuller exposition of Brexit catastrophes see recent article by Polly Toynbee). The apparent purpose of an “unfolding disaster” scenario is to shock people into supporting a second referendum that would reverse Brexit. With the likelihood of a second Referendum on the wane, the disaster scenarios of Remainers could well serve the interests of the May government. Should a Brexit deal be agreed with the European Council, Theresa May could present it and present herself as salvation, having snatched Britain from the jaws of disaster. The Brexit disaster scenario lays the groundwork for a May-the-Saviour narrative. This unintended consequence of the disaster propaganda appears to go unnoticed by prominent Remainers, perhaps because they deny the possibility of a deal. A recent article in the Guardian set the probability of a snap election at 15%, second referendum as 30%, and dismissed as nil the probability of a “good Brexit deal that keeps almost everyone content”. This attempt at sarcasm misses the serious political issue. The looming danger is that the prime minister obtains an agreement with the European Council that she could sell to the public as saving Britain from a plague of disasters, a least-worst and acceptable outcome. Underestimating one’s opponent and denying the possibility of the worst is not a sound political strategy. The first step to stop Brexit is to recognize that the May government has a strategy and its probability of success might be low but it is not zero. The second step is to establish a counter-strategy that prevents the May government achieving an apparent Brexit success. The necessary but not sufficient condition to prevent May from selling herself and her government as the Brexit saviours of Britain is that her government falls. That is the primary task of progressives whatever their position on the Leave/Remain political spectrum.